Is it stormy and thunderous weather where you can hide in the cozy and dark corners of your house, observing the chaos out there? Bright, shining, sunny summery days where you can head to the beach in your swimsuit and flip flops and feel so alive? Raining dogs and cats days where you can go get a little wet under the rain or stay indoors with a mug of hot cocoa? Where I come from, it’s tropical sunny weather. It’s usually either hot and sunny, or rainy and humid, and mostly the former. With such weather, it’s a challenge to dress up without getting all sweaty and sticky. But I got to experience very lovely cool weather when I was in San Francisco years ago for holiday. I loved it! I could be wearing a lightweight jacket or a long-sleeved top and walked all around and still stayed pretty dry. I really liked that. When I was in England two years ago, I got to experience spring and fall, and I adored these cooling seasons too. I believe it’s cold, cold weather for many of you now. For me here, there’s more rainy and humid days… Perhaps a nice change from hot, sunny and sticky days. 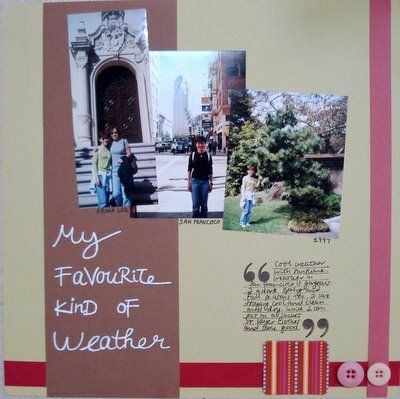 Anyway, have fun with this scrapbooking page idea that shares your adoration for a certain kind of weather! Supplies used: Cardstocks – Bazzill Basics, Buttons – Autumn Leaves “Foof-a-la”; White pen – UniBall Signo Broad; Journal clear stamp – Autumn Leaves “Journaling by Katie Pertiet”; Brown ink – StazOn “Timber Brown”; Patterned chipboard – Brenda Pinnick Chipboard Die Cut “Easy Pink Street”.